A newspaper article published in The Oviedo Voice on January 2, 2003. The article suggests that residents get rid of their Christmas trees in order to reduce the risk of accidental fires. In 2001, according to the article, the Oviedo Fire Department (OFD) conducted experiments to see which types of Christmas trees were most susceptible to fire. The article also suggests ways to properly dispose of trees. 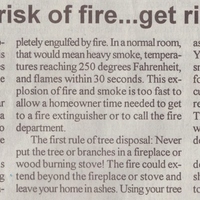 Original newspaper article: "Reduce the Risk of Fire...Get Rid of That Tree." The Oviedo Voice, Vol. XIII, No. 1, January 2, 2003: Private Collection of Sarah Thorncroft. Digital reproduction of original newspaper article: "Reduce the Risk of Fire...Get Rid of That Tree." The Oviedo Voice, Vol. XIII, No. 1, January 2, 2003. Copyright to this resource is held by The Oviedo Voice and is provided here by RICHES of Central Florida for educational purposes only. “Reduce the Risk of Fire...Get Rid of That Tree.” RICHES of Central Florida accessed April 24, 2019, https://richesmi.cah.ucf.edu/omeka/items/show/6258.